After you have completed the necessary setup tasks, use the following steps to define the Oracle Server hierarchy to protect your database(s). From the LifeKeeper GUI menu, select Edit, then Server. From the menu, select Create Resource Hierarchy. Select Oracle and click NEXT. 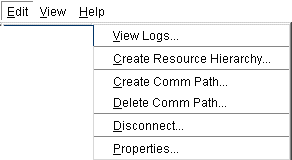 Select the Oracle Home directory Select the appropriate Oracle Home directory for this hierarchy. Select the Oracle SID Select the Oracle SID that you wish to place under LifeKeeper protection. Enter the Oracle User Name Enter the administrative user name for Oracle. This user account must have system permissions to the database. Enter Password Enter the system password for the Oracle administrative user. Optional Services Select the optional services to be protected with this hierarchy. The list includes only those services that are eligible for LifeKeeper protection. Oracle Tag Name Enter a unique tag name, or you can accept the default tag name offered by LifeKeeper. After you click Next, the Create Resource Wizard will create your Oracle resource. LifeKeeper will validate the data entered. If LifeKeeper detects a problem, an error message will appear in the information box. Another information box will appear indicating that you have successfully created an Oracle resource hierarchy, and you must extend that hierarchy to another server in your cluster in order to achieve failover protection. Click Next. After you click Next, LifeKeeper will launch the Pre-Extend Wizard. Refer to Extending An Oracle Hierarchy for details on how to extend your resource hierarchy to another server.